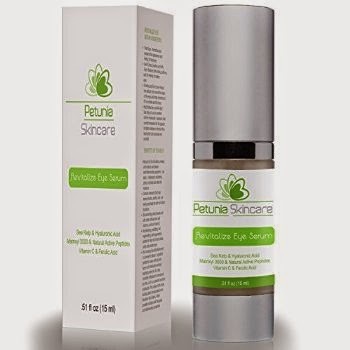 Recently..I was sent to review Petunia Skincare Revitalize Eye Serum With Sea Kelp, This product is an eye serum that addresses tired eyes and the signs of aging.The serum contains hyaluronic acid for maximum hydration. Looking for an eye serum that addresses tired eyes and the signs of aging? Our eye serum is nothing like any other "eye cream" on the market. Unlike ordinary eye creams, our eye serum has a silky and plush texture that absorbs quickly and seamlessly into the delicate area of our eyes. Our serum is unparalleled to traditional eye creams as it is loaded with PREMIUM top-of-the-line ingredients, and we mean LOADED. Our eye serum is made with high quality ingredients filled with antioxidants and nutrients. Its been a week since I have tested this serum and I have seen improvements in my dark circle and I also noticed that my fines lines have diminished. The serum is concentrated and once you apply it absorbs quickly in to your skin. The skin around my eye feel Tighter and soft. If your interested in purchasing this great serum head on over to Amazon!